English: - Any news in the papers? - They just said they have seen some crocodiles in Rouen swimming up the Seine! - Damn it... they surely must have arrived in Paris already... and I was just about to go swimming. 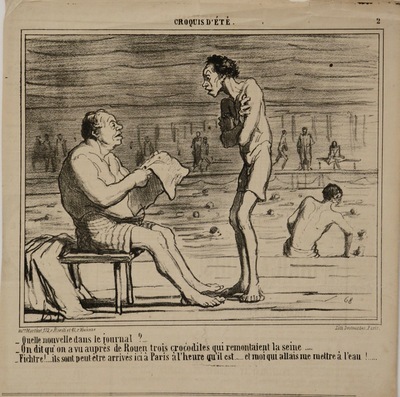 While this image could be interpreted as a satire on the hazards of swimming in the Seine, it is also lambasting Parisian newspapers, which were infamous for printing “canards,” or false news stories, as a way of maintaining readership on slow news days.